For the best blinds in Westlake Village, look no further than The Drapery Guy. We have been designing window coverings since 1981! Our store offers a diverse selection of window treatments made only of the highest quality materials. No matter the room, we can put together window treatments that will be truly special. We offer free in-home consultations. Our window covering specialist will design the proper window covering for one window or an entire house. We also have a full showroom for a complete view of numerous displays and 1000’s of fabric choices for all your custom blind options. We make the process very easy for the homeowner. We measure, design, oversee all manufacturing and do the final installation. Our installers are trained professionals in the art of window coverings and are accredited by Hunter Douglas on their entire line of shades including the exclusive Alustra Collection. For all your custom blinds & other window treatments in Westlake Village, choose The Drapery Guy! Hunter Douglas is known for their innovations in the window covering industry. They are the leader in style, color options, control selections and warranty. Delivery is quick and easy. They have options for all design tastes. There are more than 300 unique colors, patterns and textures to choose from in the designer shade collection. Each room can have its own unique color or texture to customize your space in a way like never before imagined. The ClearView Shades are ideal for keeping the rays of the sun out of your room while still allowing you to take advantage of the beautiful view outdoors. The Hunter Douglas Collection with dozens of colors and styles available can help spice up your home and add a sense of flair that extends beyond other blinds. 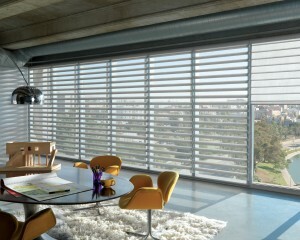 You can have your blinds customized for any awkward-shaped window with custom made templates. No job is too big or too small. The Drapery Guy provides stunning solutions to provide the look and feel you crave. Give us a call at (818) 707-8500 today.